Well the London based mice have been enjoying a blissful 4-day bank holiday weekend so we'll mostly be boasting about the jolly good time we've been having - big thanks goes to Queenie! Not sure how I am going to get through with only 48 hours of no work and just 2 lie-in's!! HK mouse is currently residing in Seattle on a work trip so had left London Towers to hold the fort...! She is supposedly working but secretly I think she there to try and 'bump' into the Greys Anatomy cast...bagsy Karev!! There will no doubt be some reports and photographs next week if she has managed to bag any free time!! 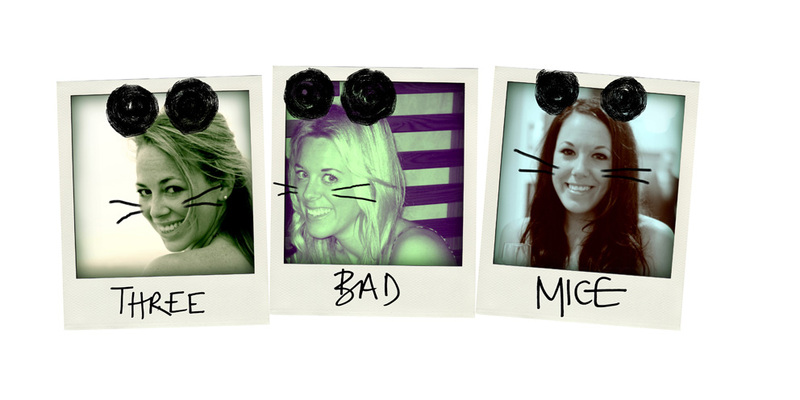 However in the mean time you're stuck with Minnie London Mouse!!! Drooling over Kate Middleton's Jubilee wardrobe. Naturally the whole weekend was all about the Queen but I couldn't help being SUPER excited about what Kate was going to wear...and she didn't disappoint. Both celebratory creations on Sunday and Monday were Alexander McQueen designs paired with her signature LK Bennett high heels. She yet again managed to look on-trend yet elegant, spot on as always. Umm'ing and Ahh'ing over my outfit for Polo shenanigans this weekend...unfortunately I am not quite there yet!! God knows what the weather will be like, therefore effecting both shoe and jacket options...and really what does one wear to a potentially rainy day at the polo?! So to answer those questions keep your eyes peeled for a post on Polo Get- up next week for future help and inspiration...I sure as hell could do with it!!! 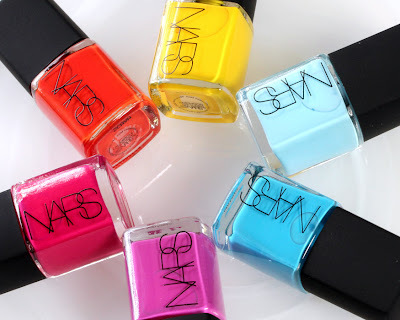 Obsessing about the new NARS nail varnish collaboration with fashion designer Thakoon Pachnigul. The colour palette is inspired by Indian Spice Markets...some vibrant and bold, whilst others pretty and paired back therefore suiting all skin tones! I want all six, however at £14 each that would total £84, is that classed unnecessary when trying to pay back my Miami credit card?! One or two wouldn't hurt though would it?!? Step 1: If using frozen broad beans, put them in a bowl, cover with water and leave to soak – then slip off the skins. If using fresh ones, blanch them in boiling water for 2-3 minutes, refresh in cold water and slip off the skins. Step 2: Rinse the beansprouts in cold water. Drop them in boiling water and allow to stand for a minute. Drain thoroughly, then refresh in cold water. Set aside. Step 3: Preheat a griddle pan on medium-high heat. Brush the asparagus with a little oil and place them on the pan in a single layer. Cook for two or three minutes, turning, until tender, crisp and lightly brown. Set aside. Step 4: Heat the remaining oil in a frying pan until hot. Add the mustard and cumin seeds. Once they begin to pop add the curry leaves, garlic and ginger. Cook for a minute, then add the drained broad beans with chillies. Add salt and a dash of water and cook until just tender. When all the liquid has gone, remove and set aside. 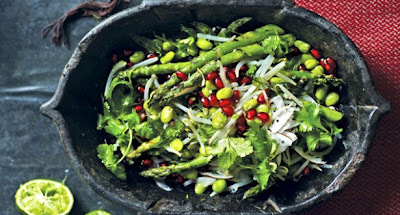 Step 5: Toss the beansprouts, asparagus and broad bean mixture together. Add the rest of the ingredients and season with sugar, lime and salt to taste. Addicted to the new E4 series Revenge...well what with One Tree Hill, Vampire Diaries, Made in Chelsea and Apprentice all coming to an end I needed some light hearted watching to get me through a week!! And, unlike Big Brother, Revenge definitely cuts the mustard! It's got a dark side with twists popping up all over the place, but covered with a shiny, Hampton's exterior...you get pretty much hooked from the first episode! Having said I won't be watching Big Brother, I guarantee when I start seeing Daily Mail coverage and Heat quoting ridiculous one liners I will secretly tune in....!! !